Pegasus Recovery Solutions Ltd. is proud to present this FREE series of educational talks designed to educate, and share solutions with, individuals, communities, and organizations impacted by addiction. 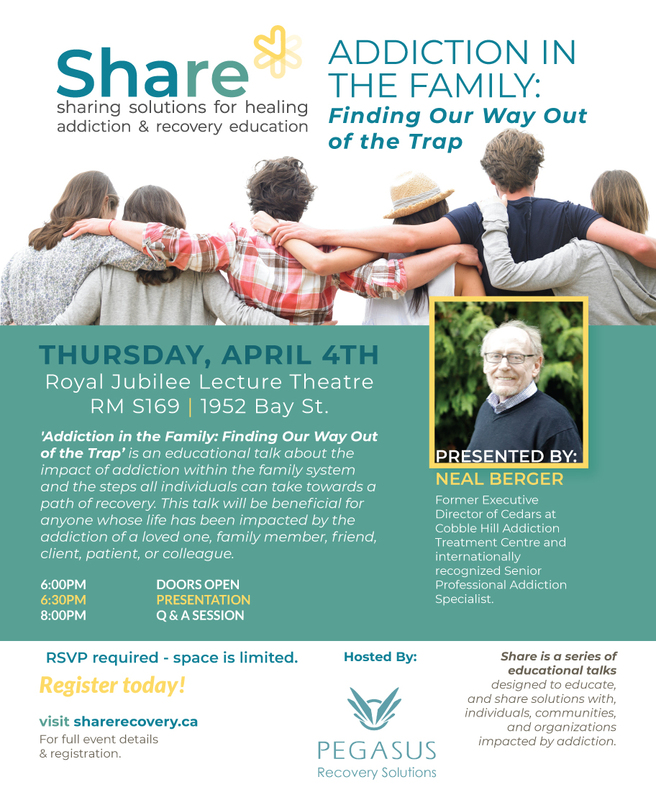 Presented by Senior Professional Addictions Expert Neal Berger, the first in the Share series ‘Addiction in the Family : Finding Our Way Out of the Trap’ is a talk about the impact of addiction within the family system and the steps all individuals can take towards a path of recovery. This talk will be beneficial for anyone whose life has been impacted by the addiction of a loved one, family member, friend, client, patient, or colleague. Prior to moving to Canada in 1984 Neal served on the faculty of the University of Nebraska School of Addiction Studies. He consulted with and assisted hospitals to develop addiction treatment facilities for men, women and adolescents. As a Canadian, Neal co-developed addiction and employee assistance services working with employers, labour organizations and government. This work was recognized internationally and resulted in services being established in 22 rural Canadian communities and one in the US. This project resulted in Neal consulting with the United Nations the International Labour Organization and the World Health Organization regarding initiating a similar process throughout Eastern Europe, Africa and South America. Neal has co-founded several Residential Addiction Treatment Centres including Edgewood Treatment Facility In 1994 where he served as President, and Cedars at Cobble Hill in 2006 where he served as Director until late 2018. Neal authored, designed and implemented “Courage to Care’. This award winning program is a cross cultural systemic intervention process designed to reduce the harm produced in families, organizations and communities by substance use and mental health problems. This program has been successfully implemented in many Canadian workplaces and other organizations. Neal conducted research under a grant from the Canadian Institute of Health Research to investigate the ability to influence the Health/Harm transfer between workplaces and communities. He was also selected to the Recovery Expert Advisory Group by the Federal Health Minister. This group produced the Life In Recovery research survey. This “first of its kind’ undertaking examined how people get into “recovery” and how they maintain “recovery. Published in 2017 by the CCSA. In 2018 Neal was elected president of the International Society for Excellence in Recovery Management. Neal has been a frequent contributor to professional journals and periodicals, produced numerous films on addiction and recovery and has given 100’s of keynote addresses to professionals in the field of addiction, family and occupational health and safety. Share is a series of educational talks designed to educate, and share solutions with, individuals, communities, and organizations impacted by addiction. Pegasus Recovery Solutions Ltd., host of the Share Recovery Education Series, provides non-residential, accessible, and comprehensive addiction recovery solutions for substance use and process related addictive disorders. Our Intensive Outpatient Program provides individuals an opportunity to move towards a thriving life in recovery while remaining active in their daily lives. Located in Victoria, BC our team, comprised of dedicated and credentialed addiction professionals, has extensive experience in addiction treatment and recovery. Through the Intensive Outpatient Program, Individual Counselling, Recovery Coaching, and Medical Monitoring, the team at Pegasus is here to support you on the path of recovery – every step of the way. pegasusrecoverysolutions.com – we grow recovery.